This 8C 2900 B is one of the four team cars built by Alfa Romeo and Carrozzeria Touring for the 1938 Mille Miglia. Driven by Carlo Pintacuda, number 142 led for most of the thousand-mile, Alfa dominated, contest. At the last checkpoint, rear brake problems sidelined it for 14 minutes. While repairs were being made his rival Clemente Biondetti flew by, and the chase was on to the finish. Pintacuda caught up to his countryman, but was blocked by the wily Biondetti and unable to get by, finishing second. The car was later bought from Alfa Corse by Count Carlo Felice Trossi. In the 1940s it came to the USA, and owner Tommy Lee hired drivers to race it at Pikes Peak and Watkins Glen. After Lee's death a young mechanic by the name of Phil Hill bought the car from the estate and drove it to victory at Pebble Beach, winning the Del Monte Cup in 1951. Subsequent owners included James F. Magin and industrial designer Brooks Stevens, who commissioned a bare metal restoration on the car in 1967. Ralph Lauren purchased the car from the estate of renowned Alfisti Bill Serri in early 2004. Mr. Lauren commissioned his long time collaborator Paul Russell to restore the car to its 1938 Mille Miglia configuration; authentic in detail, equipment, and color. 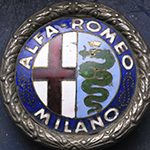 When the Alfa first arrived in our shop, we were all impressed with its marvelous patina. But a very preliminary review of the records revealed that the body had been painted by Lee (cream and brown), Hill (back to red), and Magin (blue), before a full teardown by Stevens. During our disassembly, we took special care to look for any evidence of original finishes or materials. We found original primer and Alfa Corsa red under the Magin blue paint beneath the fuel tank cover, in an area which would only be addressed during this level of body panel restoration. A scrap of red leather was found stitched in with the horsehair seat stuffing. These small samples were used as our color guide to restore this Alfa to the 1938 Mille Miglia livery you see here. A small but important sample of the challenge of such an undertaking was the restoration of the gauge faces. During disassembly we found that the face material was translucent styrene. Upon removal of the MPH over-paint we discovered the original kilometer markings were still visible as very slight depressions in the soft plastic. A masking pattern was created to repaint those original markings, and the speedometer face now looks as it did over 70 years ago. With the help of extensive pictures from the Corrado Millanta photo archive, Alfa authority Simon Moore, Dr. Fred Simeone, Gordon Barrett and numerous other historians and collectors, we researched the details that made this Jano designed engine and Touring coachwork such a handsome and superb performer. One research trip took Paul to the Alfa-Romeo Museum in Milano. There he was able to finally locate the correct part number for an extremely rare 8-cylinder Bosch magneto. Also catching his eye was a very unique ignition loom, with its edges appearing to be rolled inside out while being made from one piece of tubing. We had previously only seen these in the Millanta pictures. The spark plug holder mounted onto the valve cover just adds to the small details that make this racing engine so period correct. While this Superleggera body shell was substantially original, the unique wrap-around Mille Miglia windshield had been changed very early on. We made a new one, with the aluminum support and leather skirt as created by Carrozzeria Touring, by scaling off the period pictures. Additionally the front valance, tail lights, license plate lights and spare tire lid latches had to be reproduced utilizing the period pictures. To complete the race day look we replicated the headlight grilles and covers, radiator shade, and finally the hand painted Italian colors and hood decals as they appeared in the 1938 Mille Miglia. In the spring of 2005, this Mille Miglia Spider was included in the "Speed, Style and Beauty: Cars from the Ralph Lauren Collection" exhibit at Boston's Museum of Fine Arts. That fall it won Best in Class when Alfa Romeo was the featured marque at the Pebble Beach Concours d'Elegance. During the 2006 Goodwood Revival, Phil Hill reclaimed his place behind the 2.9 wheel, driving a few laps during a tribute honoring his racing career. Most recently, this marvelous Alfa was one of the cars featured in the Art of the Automobile exhibit at the Paris Musée des Arts Décoratifs in the spring of 2011.